Do you buy or make a bookmark? I buy them at book stores. Fancy and beautiful words printed. I make them on my own. I don't use any bookmarks. I don't read any books. i don't use any bookmarks. Just fold the "Dog ears". Easy and convenient. 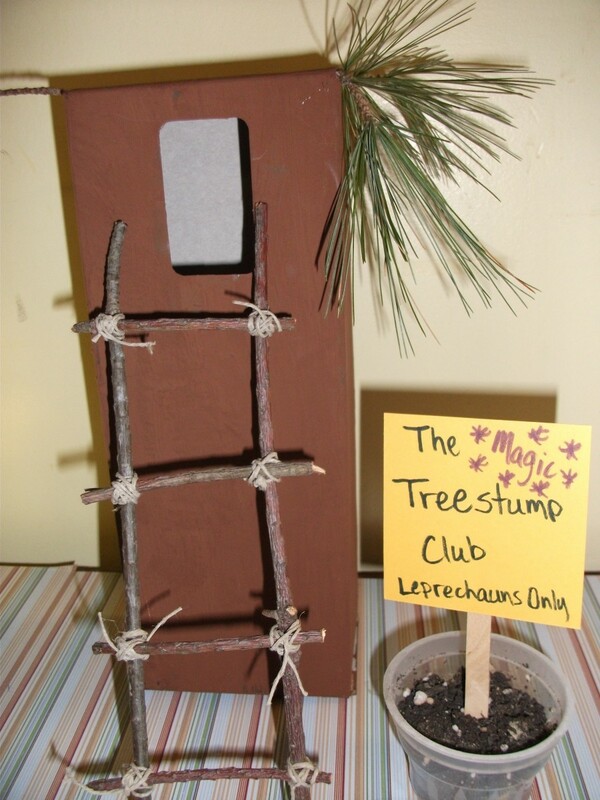 Ever wonder what to do with your kids on St.Patrick's Day? You don't have to spend money and waste your time running about outside while you could spend some quality time at home with your kids. 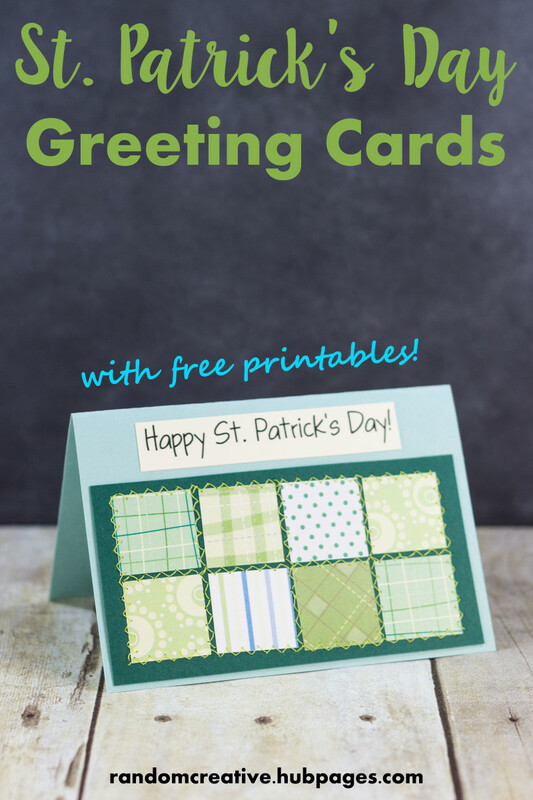 Use this opportunity to teach your kids on how to recycle empty boxes into a Shamrock Bookmark for both kids and adults. In addition, you could briefly explain to your kids about the true meaning of the shamrock or clover. Make this day an eventful day with useful ideas to enhance your kids knowledge and recycle your trash into useful objects. Stop making "Dog Ears" - I have a bad habit of flipping down the edge of the pages into "Dog Ears" whenever I need to stop reading my favorite book and recipe books. Too lazy to look for papers to mark those important pages and very reluctant to buy those beautiful bookmarks which I find them costly. "Dog Ear" pages are really irritating especially when I have read that particular page and forgot to flip up the "ear". Hence, reading the same page again. Furthermore, "Dog Ear" pages could end up the books looking old and worn out. Cultivate the reading habit- With a bookmark, you could slip in the Shamrock bookmark in between the pages that you last read the bedtime story book with your kids. Searching for the last read page will delay some time and your kids would lose patience, running off to play something else instead of listening or reading the story book. With the Shamrock Bookmark, you and your kids could identify the last read page and start reading without wasting much time. Hence, you could cultivate the reading habit with your kids. Reuse and recycle- See those empty paper boxes from your grocery shopping trip? Most of the dry food items that we purchase are packed with beautiful decorated paper boxes. Unfortunately, we usually discard these boxes into our trash bin instead of reuse and recycle them for a good cause. Take this opportunity to teach your kids on how to reuse and recycle these empty boxes into useful Shamrock Bookmark or other items. A bookmark doesn't have to be fancy or beautiful. 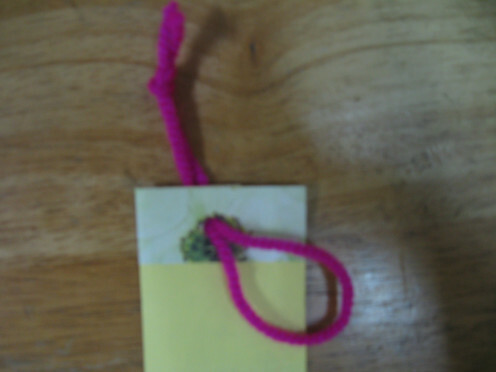 A simple handmade bookmark is as useful as store bought bookmarks. 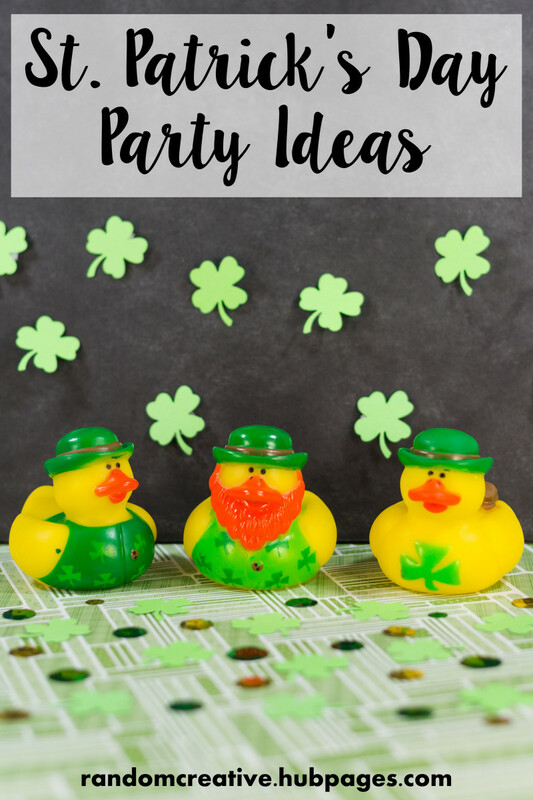 Kids and adults can join in the fun as it is quick and easy to make. You don’t have to waste money on purchasing the stationary materials. Just reuse whatever materials that you can find at home. I have a habit of keeping piles of empty card boxes, newspapers, unwanted plastic bottles and containers in my storeroom. These "trash" are useful to recycle centers where they turn the "trash" into cash which are then donated charity centers. I searched through the piles of card boxes and found a small card box of mushroom soup which the size is similar to a bookmark. Next, I found some left over green color gift wrapper and color papers too. You can substitute the red yarn with ribbons or colorful threads. It is easy to draw a shamrock ( clover). 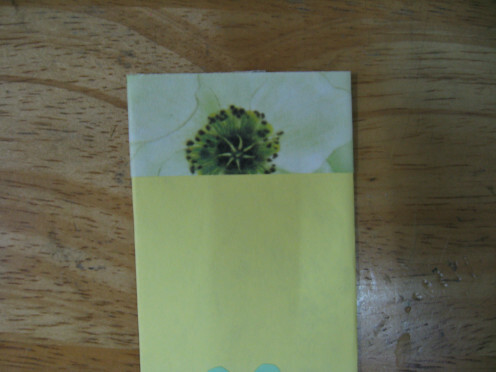 Just simply draw 3 little hearts, cut them out and paste them in the middle of the bookmark. 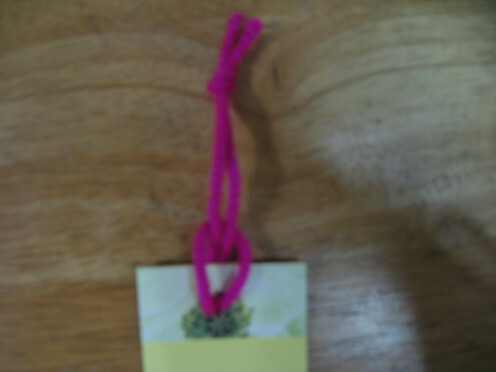 As for the heading and the footer, wrap them up with the gift wrappers so that the bookmark doesn't look too boring. 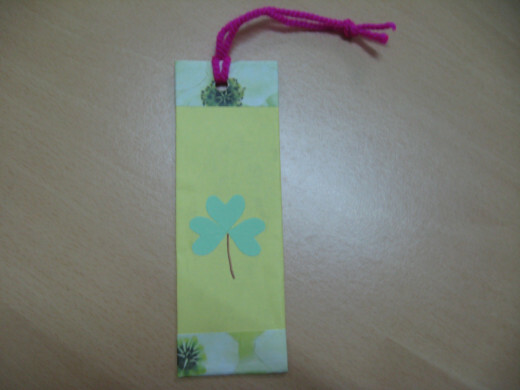 If you could find a real 3 or 4 leaflets clover, it would be more meaningful and beautiful for laminating on a bookmark. Put your clover between the pages of a thick book, preferably a telephone which is thick and heavy enough to flatten the clover. Leave the clover in the book for at least 3-5 days. 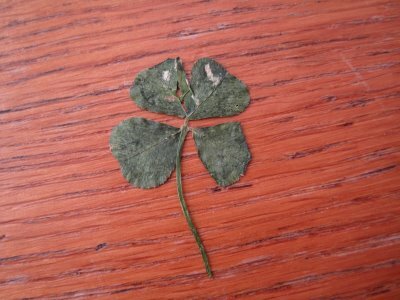 When the clover has dried up, remove it from the pages of the book. 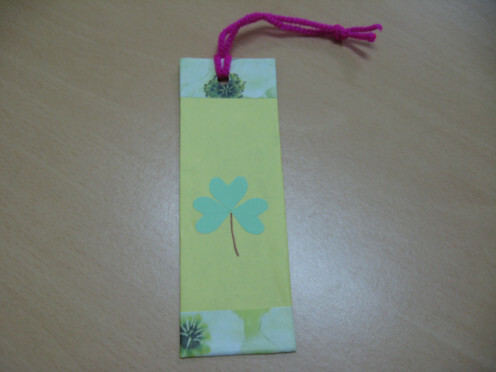 Apply glue at the back of the dried clover and paste it onto the front bookmark. You could either laminate the bookmark or use a piece of transparent plastic book wrapper to cover up the bookmark. This is to ensure that your clover doesn't tear into pieces, in case you accidentally brushes it with your hands as you know that dried up leaves are brittle. Here are the step-by-step procedure with photos as guidelines. Enjoy your craft work ! A Small empty card box-get those small card boxes from any dry food stuff. Green gift wrapper-don't throw away small pieces of wrapper from birthday gift wrapping. Reuse them for your future craft projects. 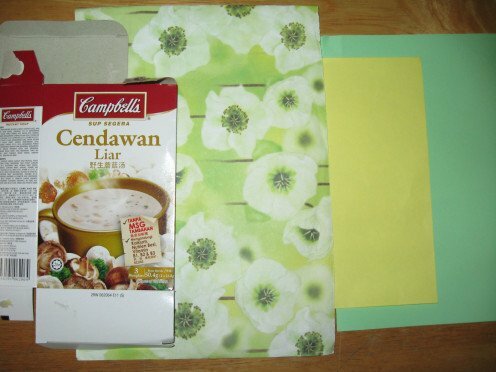 Yellow and Green Papers- Remember those left-over construction papers you had in your previous craft project, use them. Don't waste the new construction papers. Try to keep minimum use of new ones. If you don't have any, buy those bulk pack multi-color construction papers that comes in 500 sheets per pack. More in quantity and cost less. A bottle of White glue-I don't use the normal light brown glue because it is not sticky and comes off easily. I prefer to use multipurpose white glue as it is safe, non-toxic, perfect for light home repairs, crafts and best of all washable too. White glue would not stick to your fingers, easily wash with running tap water. A pair of scissors-any school scissors will do the cutting. Most scissors have lightweight plastic body with sharp metal blades. Light, easy to handle and great for all paper crafts and card making. A penknife-Do be careful with sharp penknife, especially the kids. Don't let them handle the penknife as they might accidentally cut their fingers. I use the stationary penknife as the blade is not thick and heavy as pocket penknife. Need it to cut out the card box. a Pencil-To draw the heart shapes for the clover. 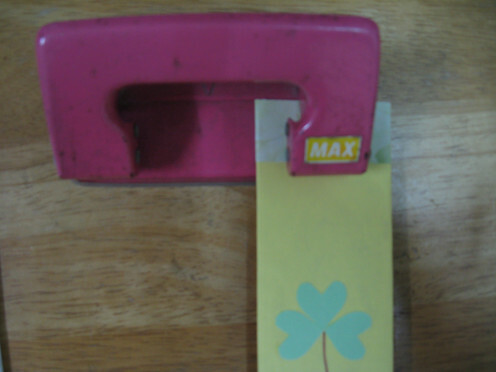 a Paper Punch Holder- Borrow a paper punch holder from your hubby or brother. It comes with a metal punch that creates 2 holes. You need to adjust the punch holder in the middle of the top bookmark to punch the hole. 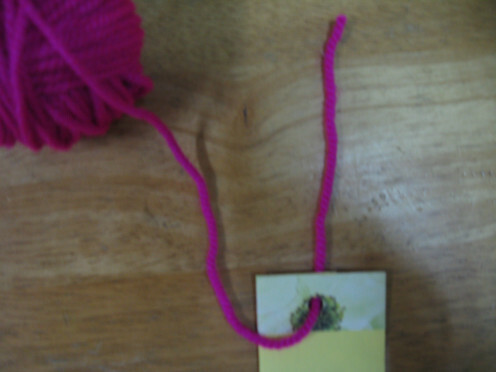 a piece of Red Yarn- You can substitute it with ribbons or strip of long cloth, anything that you like. I chose red yarn because I could only find this color at home and it is soft, doesn't comes off easily. 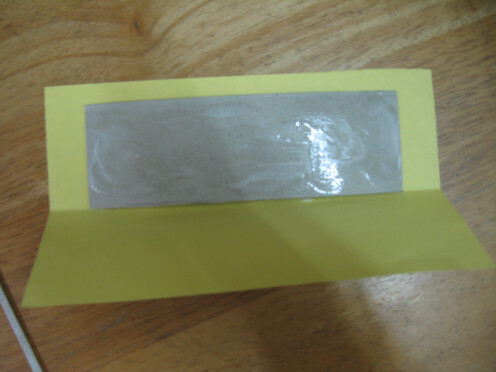 Cut a rectangular shape out of the old card box, roughly the size of a bookmark. Fold it into half and apply glue in between. Ensure that the card box is paste firmly. 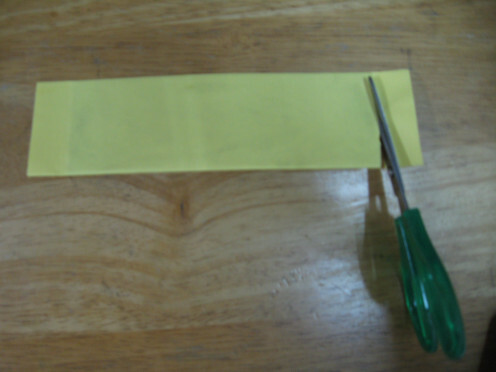 Use the yellow paper to wrap the hard card by applying glue on the front and back of card. Trim off the excess bits of paper. 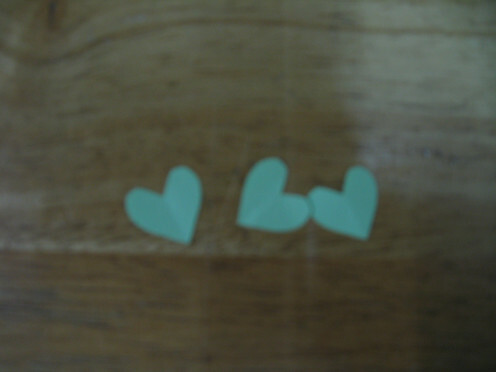 Draw 3 tiny hearts on the green paper. 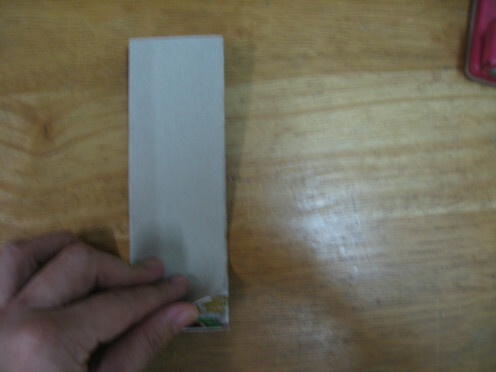 Fold the green paper into half, horizontal way. Draw 3 half heart shapes. Cut them out. Open up the hearts. 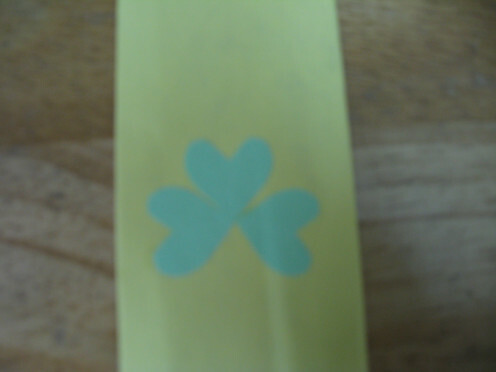 Paste the hearts exactly how a shamrock or clover leaf looks like. Use a brown marker to draw the stem. 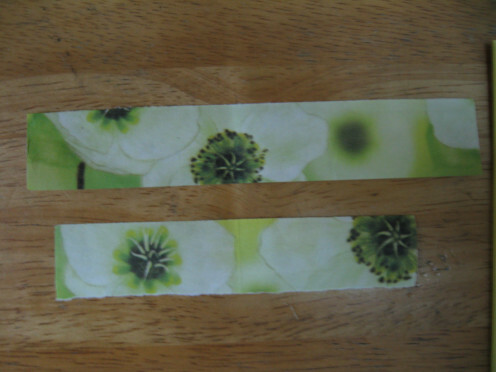 From the green gift wrapper, cut out two big strips, 2cm in diameter, 8cm in length. Apply glue at the back of the strips and paste one piece at the top and the other at the bottom. 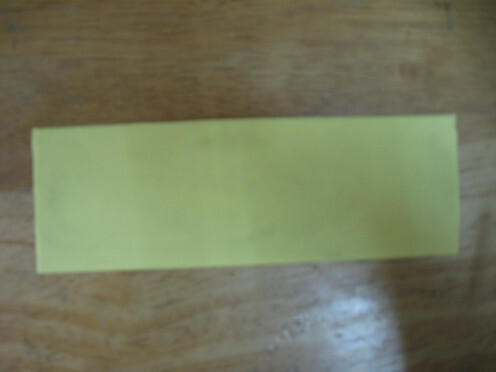 Ensure that the strips covered over the bookmark, from the front to the back, as photo shown. Use a punch holder to punch out a hole in the middle of the top bookmark. In order to make a correct adjustment to punch one hole at the center of the top bookmark, remove the bottom cover of the paper punch holder. Hold the punch holder upside down and insert the bookmark through the opening mouth. Adjust the paper exactly in the middle of one of the hole. Press down the punch holder. You will get a nice one hole at the center without fail. Slip a red yarn through the hole. Measure how long you want. Cut off the yarn and take both yarns together, tie into a knot. 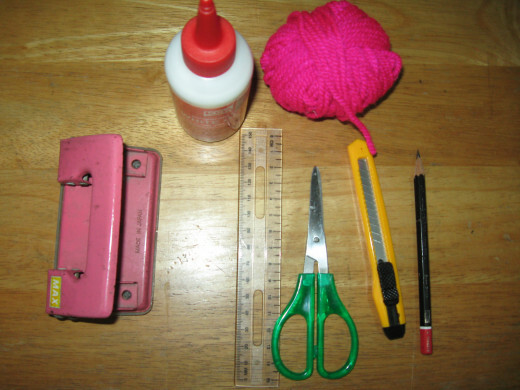 Insert the tied yarn through the hole and pull it into the loop, as photo shown. Pull it up tight. 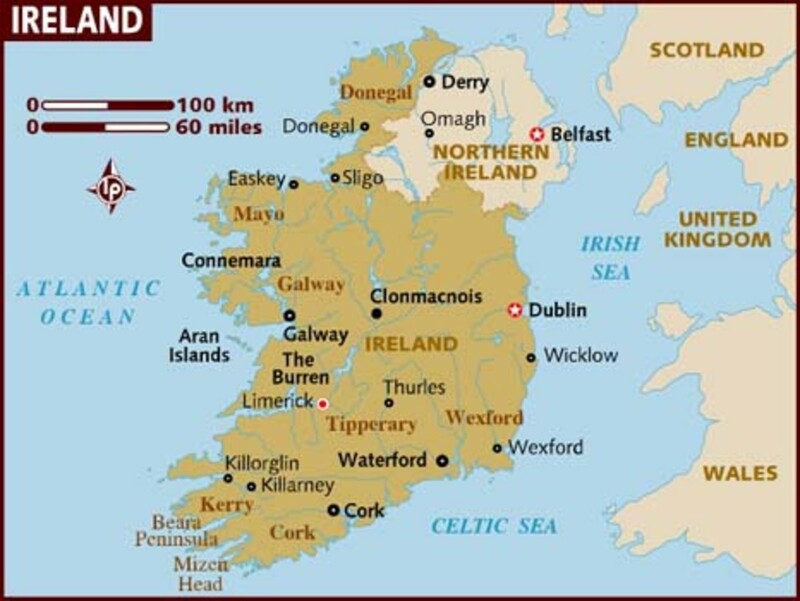 Use a marker to write St.Patrick quotes or you can leave it blank. I prefer blank bookmark so I didn’t write any words. Here you go, enjoy your craft work ! 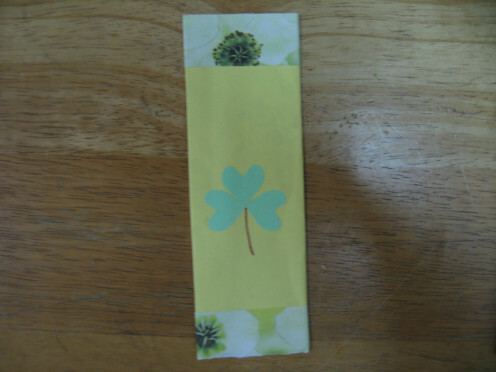 Another option in making St.Patrick's Day bookmark is folding the origami clover. 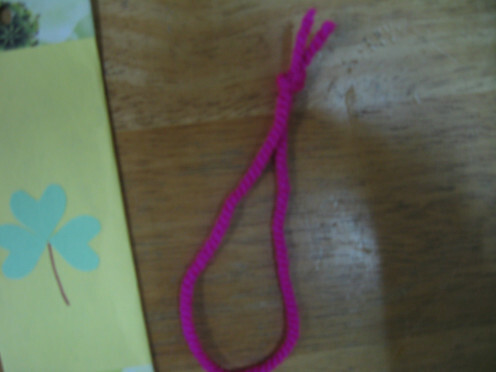 Yes, you could fold an origami clover and attach a yarn at the top to make a lovely bookmark for your readings. On St. Patrick's day, I am going to stay at home and celebrate making some "green" work. Baking cookies, desserts, gardening, making a bookmark, send SMS. Save money and time. Looking for a healthy meal for the family? 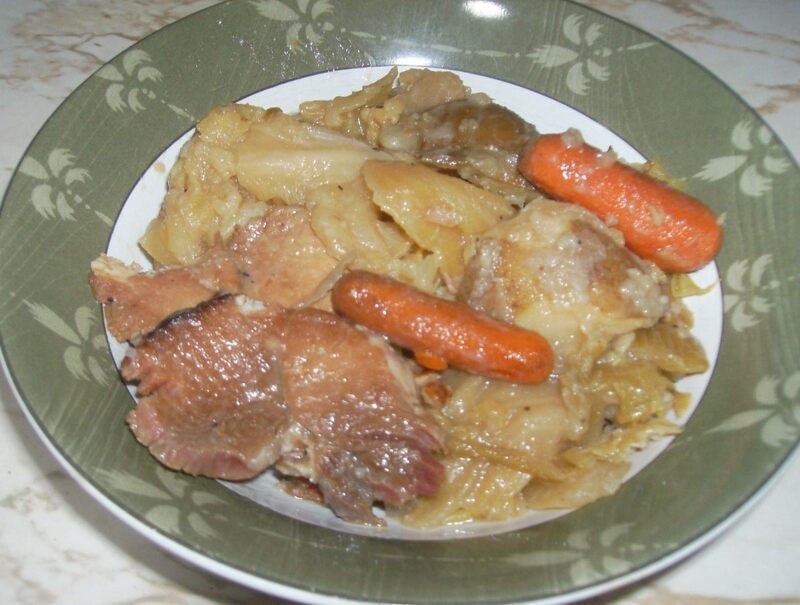 Here is a simple chicken recipe for the family which is quick and easy to cook. A great idea to keep the kids busy. 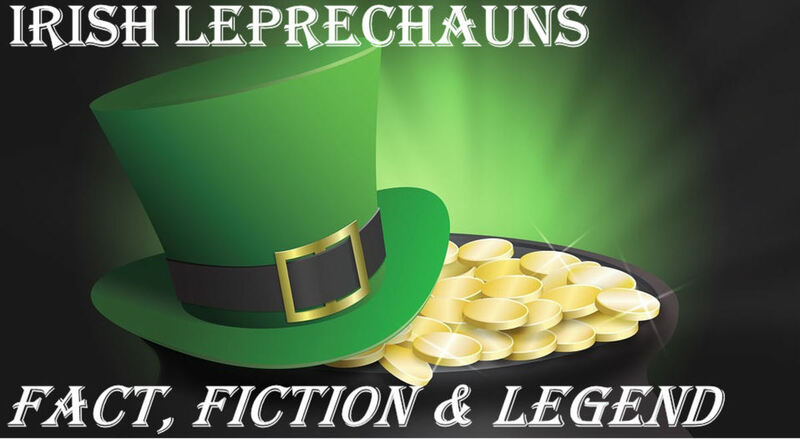 The next step (or maybe the first step should be) to read a children's picture book together about how St. Patrick's Day came to be. thanks, yes, i used discarded papers for the bookmark, never throw them. Love this. I will do this together with our grandchildren. Fun little craft to do for kids or for ourselves. I miss the fun part of being in the classroom...shamrocks everywhere with math facts and sight words and spelling words. This is a winning hub for several reasons. Not only are you spending quality time with your children in creating these bookmarks but you are also using items that would normally be discarded (hopefully recycled) and also encouraging reading which is the intent of a bookmark. A win-win-win! Up votes and sharing. sorry, this is not a toy, it is a bookmark, for your books. Anyway, thanks for dropping by. 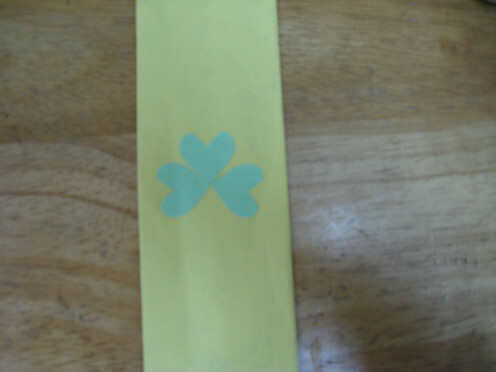 this toy looking very pretty and pics says complete technique "How to make a Shamrock Bookmark for St.Patrick's Day"
i am sure you will enjoy this bookmark. thanks. Hope to do more. a gorgeous and complete how-to, as endearing as it is detailed. How GOOD to be so hands on with your children, and cultivate the reading habit. I'll just bet searching for this mutually made treasure among the pages changes the game up, all right--from video games to story-time!! Have a Happy Saint Patrick's Day !! !